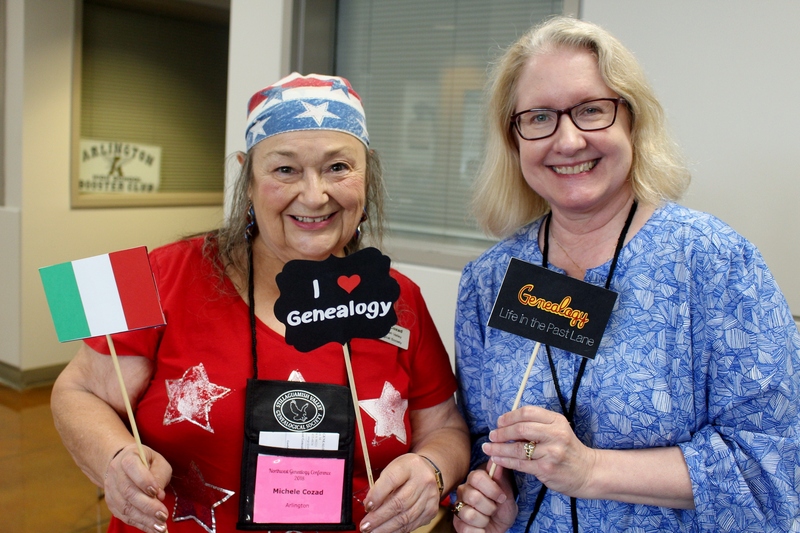 What a great way to start one of the region’s best learning and networking opportunities: a free day at the Northwest Genealogy Conference! Almost 250 genealogists gathered at the Byrnes Performing Arts Center in Arlington to take part in pre-conference classes on Wednesday, August 15, 2018. Most attended the free beginning genealogy class “Let’s Start Off on the Right Foot!” with Amie Bowser Tennant. Even those of us oldies (but goodies) learned more than a few new tricks, resources and how-to’s. There were also three specialized workshops available to attendees. Those lucky enough to get into CeCe Moore‘s “Digging Deeper With Autosomal DNA” (filled up online in just SEVEN minutes! ), learned tools and steps to understand genetic genealogy. Janet Camarata taught a class in how to use Family Search more efficiently and effectively while Mary Kircher Roddy taught a class on how to use Excel for genealogy. The evening closed with a “Meet and Greet” taco bar at the Gleneagle Golf Course. What a great way to see old friends and make new ones. Tomorrow we’ll be treated to three plenary sessions with CeCe Moore. Did you see CeCe’s recent interview with Megyn Kelly on solving crime cases with DNA? Check it out here. So interesting! In addition to CeCe’s presentations, we’ll also have to choose just two classes from the ten offered — everything from Catholic ancestors and coroner’s records to historical maps and Swedish research. Combing through the 150+ page syllabus now. Will be hard to choose! If you aren’t one of the 300+ people who have already registered for the conference, don’t despair! You can register at the door for one day, two days or all three! 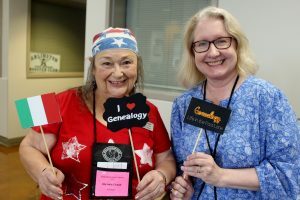 You can’t register online anymore, but show up at the door and the uber-efficient volunteers from conference host Stillaguamish Valley Genealogical Society will get you set up. Just show up early! Doors open at the Byrnes Performing Arts Center at 7:30 a.m.
It’s not too late to register for one of the premier conferences in the region! 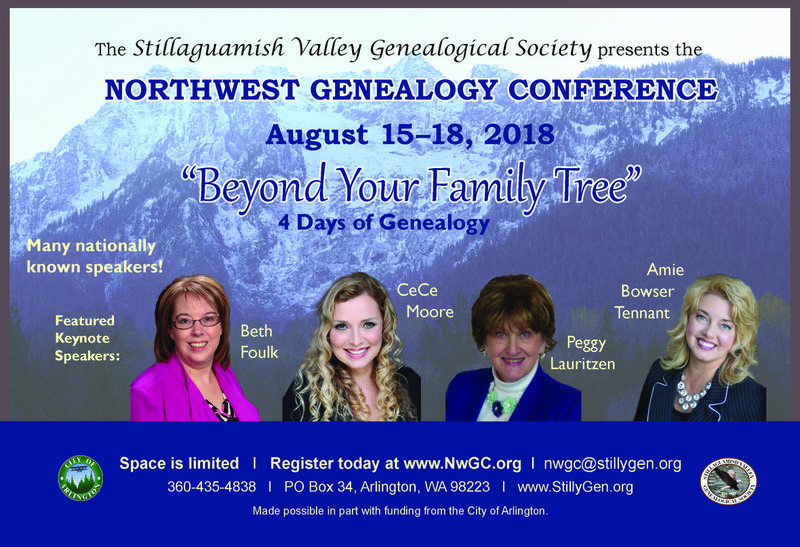 The Northwest Genealogy Conference opens on Wednesday, Aug. 15. 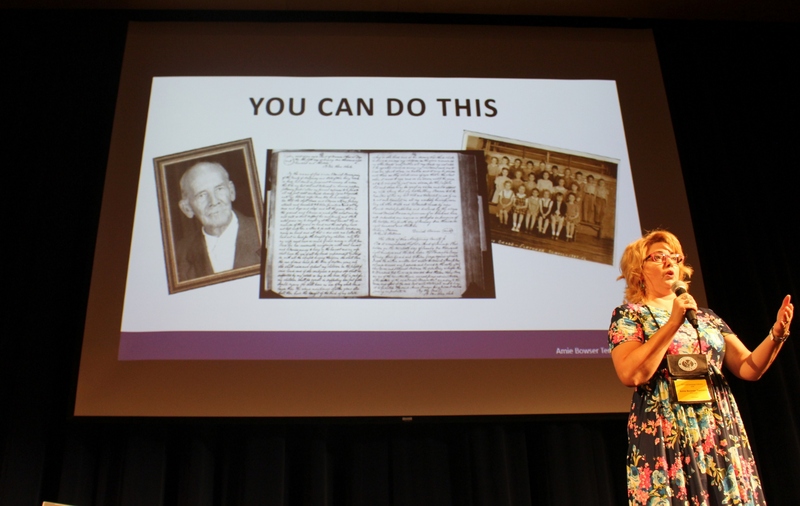 FREE Beginning Genealogy Class starts at 1:00 p.m. Amie Bowser Tennant will help beginners (and not-so-beginners) learn how to get started (or restarted). If you plan to attend, but forgot haven’t registered, please register here. The class is free, but organizers need a count to insure there are enough materials. Meet & Greet Taco Bar from 5:00 – 7:00 p.m. at the Gleneagle Golf Club. Available for full conference attendees. Registration is $5. No host bar available. If you plan to attend but forgot to register, please go to www.nwgc.org to register. Registration opens bright and early at 7:30 a.m. at the Byrnes Performing Arts Center, 18821 Crown Ridge Blvd., Arlington. The conference organizers have been hard at work for months and months to ensure you have a great time. A full day of classes, including three keynote sessions with CeCe Moore. WSGS will also be holding a society management class in Room 113 during the lunch period. Come listen to WSGS Vice President Donna Potter Phillips talk about “How to Lasso a Good Speaker” for your society meetings. Vendors and Information Tables. Make sure you visit the vendors and informational tables in the common area and classrooms. A Night on the Town in downtown Arlington. Fifteen local businesses will stay open until 8:00 p.m. to allow conference attendees to browse and shop. Many shops will have appetizers and door prizes. A full day of classes, including three keynote sessions with Peggy Lauritzen. Also, Ginny Majewski, WSGS President, will conduct a class called “So, Now You’ve Been Elected” for society society officers and members. The class will be in Room 113 during the lunch period. Dress as Your Ancestor Day. Rent/buy/make a costume to honor an ancestor or your heritage. Every year more attendees are taking part in this fun activity. There are consignment shops downtown Arlington that have costumes also. Conference Banquet with CeCe Moore. Listen to CeCe talk about making history with genetic genealogy. The banquet requires pre-registration and, at last report, was almost sold out. No tickets will be sold at the door. If there’s still room, you can register here. Our last full day of classes, learning, shopping and networking. Beth Foulk will be the keynote speaker for two sessions. Heirloom Jewelry. Is it trash or is it treasure? Bring some of your heirloom jewelry items with you and find out. We will offer FREE expert analysis on Saturday during lunch. Sign-up at the Info Desk anytime during the conference to reserve your time…limit of 3-4 pieces please. Don’t miss this conference! You can register for all three days, just one or even at the door. Click here for more information. Are you looking for a genealogical learning experience on par with the big national conferences, but with a more intimate setting and personal feel? If so, the Northwest Genealogy Conference is the conference for you! The conference is August 15 – 19, 2018, at the Byrnes Performing Art Center in Arlington, Washington — and still has spots open. To register, click here. Like the national conferences, there are nationally known speakers on a wide range of topics. 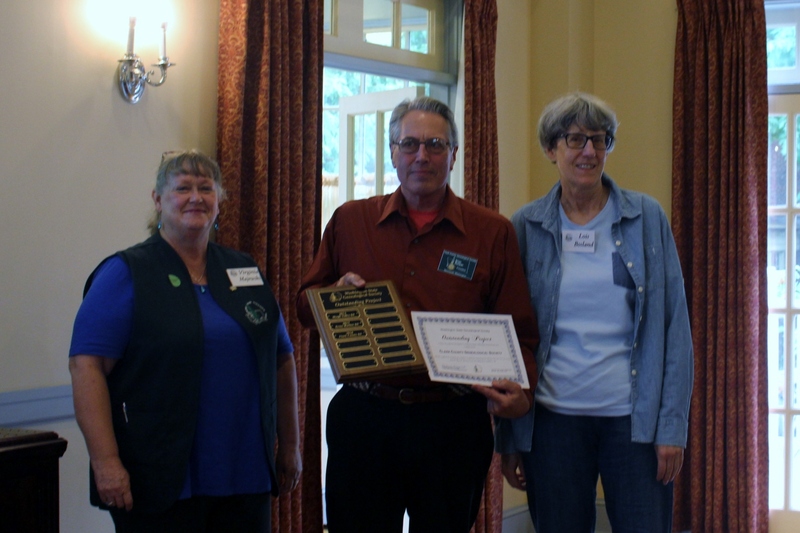 This year’s keynote speakers, Ce Ce Moore, Beth Foulk and Peggy Lauritzen, are well known in genealogical circles. In fact, you’ve likely heard about Ce Ce in the news lately. She’s garnered national attention for the DNA assistance she provided to law enforcement which led to arrests in several murder cold cases. For the beginning genealogist (and those needing a “refresher”), there will be a free class on Wednesday, the 15th, and for the more serious, there are additional in-depth workshops offered that day. Unlike the big conferences, NWGC offers a much more intimate and personal setting with much less walking. Along with the great education that you will receive, there are also fun activities such as “Dress as Your Ancestor Day,” the cousin match board, door prizes and more. See www.nwgc.org for more information and to register. See you there! 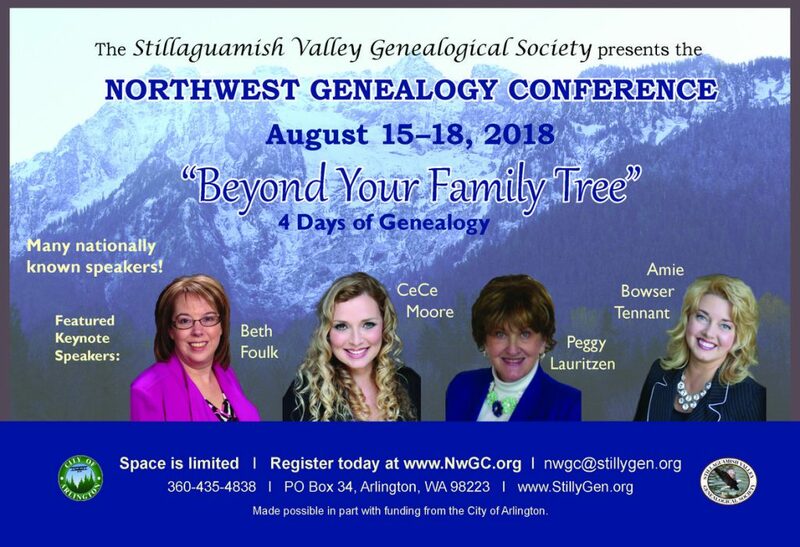 If you’re planning to attend the Northwest Genealogy Conference, you won’t want to miss CeCe Moore’s presentation “Making History with Genetic Genealogy” at the banquet on Friday, Aug. 17. You MUST purchase your banquet ticket in advance and it’s nearing capacity! Tickets will not be sold at the door. 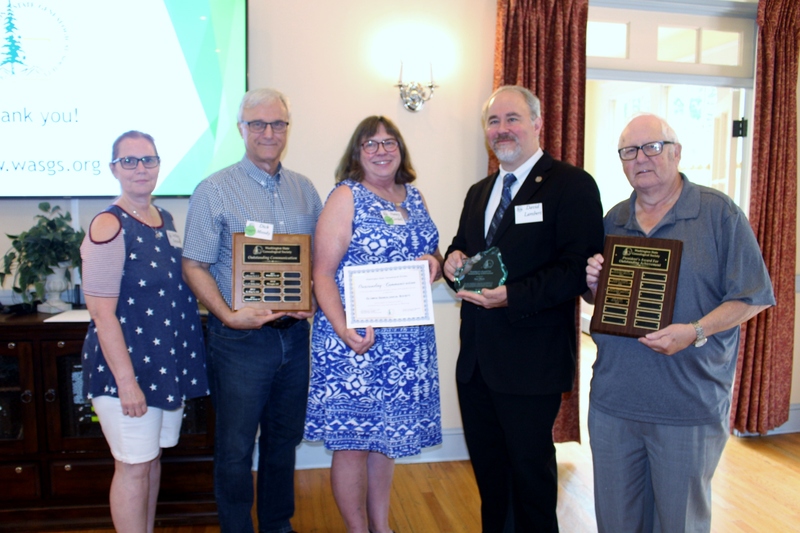 CeCe will be talking about a very timely subject: “Making History with Genetic Genealogy.” Recent strides in technology have enabled genetic genealogy to play a leading role in both rewriting and making history, and CeCe has been along for the ride. Get yourself registered for the conference and don’t forget that banquet ticket! 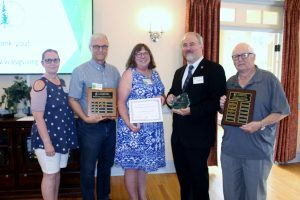 JCGS takes a break in July and August. However, we have some Amazing Plans for October and November! This is the time to put these on your personal calendar and take action on saving a place for yourself! DNA: Jefferson County Genealogical Society (JCGS) is excited to announce they are bringing Ce Ce Moore to Port Townsend November 10, 2018. Ce Ce Moore is the genetic genealogy consultant for the popular PBS television series “Finding Your Roots” with Henry Louis Gates, Jr. Her work has also been featured on 20/20, Genealogy Roadshow, Nightline, Good Morning America, The Doctors and many other well-known TV shows. Her primary focus is promoting genetic genealogy through the media. Ce Ce is the co-founder of the Institute for Genetic Genealogy and has written the popular blog “Your Genetic Genealogy” since 2010. Ms. Moore will be presenting an all day DNA seminar covering “I Have My Results, Now What”; “Seven Key Concepts to Working with Autosomal DNA”; “Autosomal DNA: Discovering Your Ancestors in You”; and “Creating and Utilizing Genetic Networks in Your Research”. Her talks will cover beginning, intermediate, and advanced tools for incorporating DNA into genealogical research. Currently there are only 50 seats remaining in the USO Building at Fort Warden State Park. Each seat is $75 for the day. Doors open at 8:30 am, lectures are 9:30 am to 3:30 pm with a break for lunch. Persons must complete the Ce Ce Moore Registration Form and other instructions found on the JCGS website www.wajcgs.org to reserve a ticket. GENEALOGY CLASS: “BEYOND THE BASICS” Do you still have questions or ‘brick walls’ after following your family in censuses and vital records? Want to learn about how your ancestors lived, not just where they lived? “Beyond the Basics” may be just for you! This class, offered by Jefferson County Genealogical Society (JCGS) is designed for those who want to answer more questions about their families. 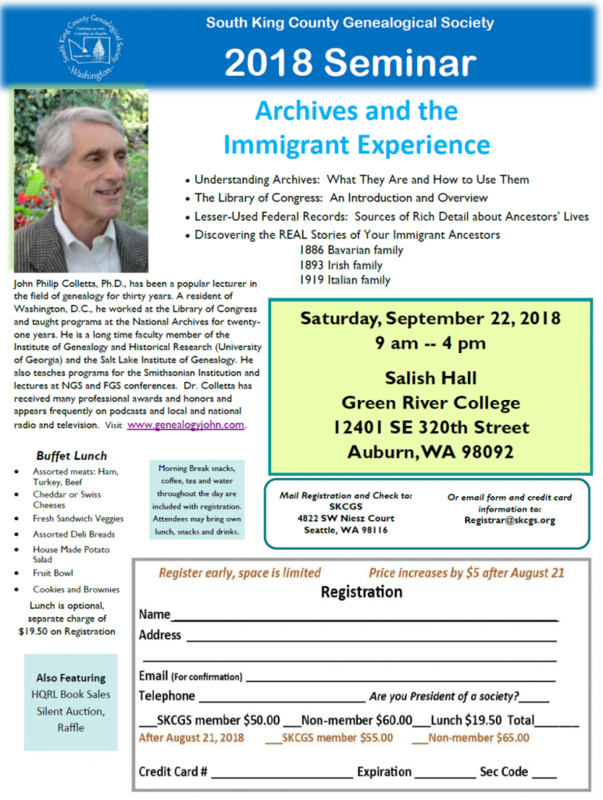 We’ll talk about military, immigration, land and probate records as well as some techniques that can be used to solve difficult problems. Not for the individual just starting out, this course will allow participants to take their family history research to the next level. The program will be held on the Monday afternoons of October 1, 8, 15, 2018, 1:00-3:30 pm at the Historical Research Center, 13692 Airport Cutoff Road (Highway 19). Cost is $30 for members, $55 for non-members (includes a $25 one year JCGS Membership). Class is limited to 18 participants. Complete the registration form at our website www.wajcgs.org and mail a check to JCGS, PO Box 627, Port Townsend, WA 98368 by September 24, 2018.